Heather E. Cunningham, Amanda Jones, and Sara Thigpen in And Miss Reardon Drinks a Little. Photo by Connolly Photo NYC. 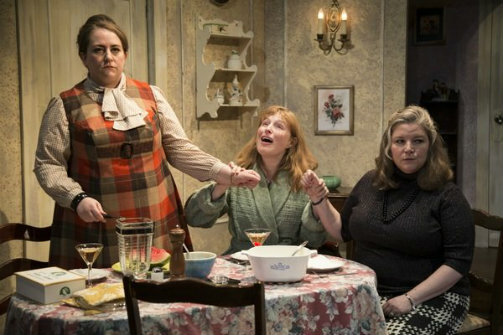 BOTTOM LINE: Sibling rivalry and nervous breakdowns are on the menu when three middle-aged sisters sit down to dinner circa 1967. If you’re familiar with the work of the late Paul Zindel, it’s likely because you’ve read one of his young adult novels (the best known is The Pigman), or you’ve seen his Pulitzer Prize-winning play, The Effect of Gamma Rays on Man-in-the-Moon Marigolds. Retro Productions has turned their attention to one of Zindel’s lesser-known stage works, And Miss Reardon Drinks a Little. Originally produced in 1967, Miss Reardon has a lot in common with Gamma Rays, including a Staten Island setting, an all-female family unit, and a character with an acute fear of death. The “Miss Reardon” of the play’s title is Catherine (Heather E. Cunningham), an unmarried, middle-aged woman who works as an assistant high school principal. Her sister, Anna (Amanda Jones), is a science teacher at the same school (Zindel was himself a high school science teacher from—you guessed it—Staten Island). The sisters also live together; in fact, they still live in the co-op apartment where they grew up, raised by an angry single mother who has only recently passed away. A third sister, Ceil (Sara Thigpen), is coming over for dinner tonight to discuss a sensitive issue—namely, Anna’s mental health and what to do about it. The discussion is bound to be a tense one, not only because Catherine and Anna bear numerous personal grievances against Ceil, but also because Ceil is the local school superintendent, and Anna’s job is in jeopardy. Into this uneasy situation, several neighbors insert themselves, including a pushy Avon lady, a nervous fellow educator, and an obnoxious glass salesman. Zindel’s evocation of a specific social milieu is masterful; the play reminds us that not so very long ago, the lives of single, “white-ethnic” women (Jews and Catholics were considered “ethnics” back in the day) were often depressingly narrow and fraught with uncertainty. Director Shay Gines doesn’t always get the rhythms of this world exactly right, though to be fair, the play itself tends to rehash the same points multiple times. But the show boasts some good performances: standouts include Jones as the emotionally unstable but highly sympathetic Anna and Rebecca Holt as Mrs. Stein, a guidance counselor with a complex relationship to the Reardon sisters. Straddling the line between black comedy and melodrama, And Miss Reardon Drinks a Little provides a challenge that this production doesn’t quite meet. Zindel fans may enjoy discovering how this piece fits into his oeuvre as a whole, and New Yorkers of a certain age will definitely appreciate its portrait of a bygone era in the city’s history. But ultimately, it is still eclipsed by Gamma Rays, and we’re overdue for that revival. And Miss Reardon Drinks a Little is by Paul Zindel. Directed by Shay Gines. Set Design is by Jack & Rebecca Cunningham. Lighting Design is by Asa Lipton. Sound Design is by DeLisa M. White. Properties Design is by Sara Slagle. Stage Manager is Elizabeth Ramsay. The cast is Wynne Anders, Christopher Borg, Heather E. Cunningham, Rebecca Holt, Amanda Jones, Sean J. Moran, and Sara Thigpen.